If you are a manufacturer, distributor or importer we can offer you a warehouse storage and distribution service of the highest quality available that is built around your specific needs. We are able to accomodate both short term or long term storage contracts, as well as pick and pack products to suit your type of business. We can also offer our on site loading and unloading ramps for de vanning containers, and palletise and labels goods. 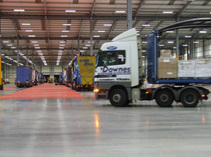 Coupled with our highly flexible distribution options, we are capable of storing, dispatching and delivering your goods whether it being 1 pallet to a full unit load. We are always happy to talk with new and exsiting customers about their storage requirements so please do not hesitate to get in contact and we can talk on more details about the tailored service we can offer your company.